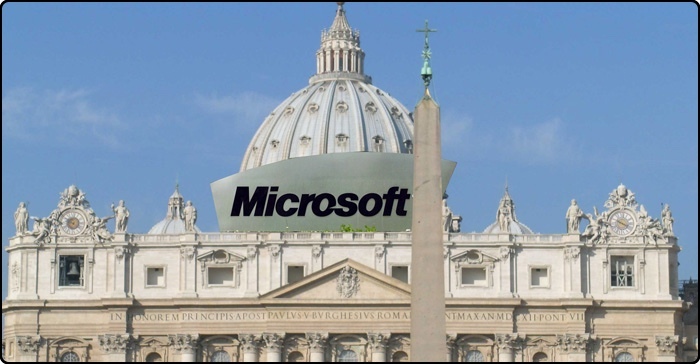 In late 1994, a news story purportedly issued by the Associated Press began circulating online, primarily via email, claiming that Microsoft had bought the Catholic church. The story, which bore a Vatican City dateline, noted that this was "the first time a computer software company has acquired a major world religion." The article then quoted Microsoft Chairman Bill Gates as saying that he considered religion to be a growth market and that, "The combined resources of Microsoft and the Catholic Church will allow us to make religion easier and more fun for a broader range of people." Under the terms of the deal, Microsoft would acquire exclusive electronic rights to the Bible and would make the sacraments available online. Most of the article was clearly parody. For instance, it compared the business practices of Microsoft to the Catholic Church's historical conversion efforts, claiming that throughout history the Church, like Microsoft, had been "an aggressive competitor, leading crusades to pressure people to upgrade to Catholicism, and entering into exclusive licensing arrangements in various kingdoms whereby all subjects were instilled with Catholicism, whether or not they planned to use it." The fake news article first appeared in early December of 1994 and spread rapidly. Most people recognized it as a joke, but some people thought Microsoft itself was the source of the joke, and they either phoned or emailed the company to express their anger. Microsoft also received calls from people who believed the story was true and wanted more details. One person called to express their amazement that the Roman Catholic Church was actually willing to sell. As Microsoft continued to receive calls, the company eventually felt compelled to issue a formal denial, which it did on December 16, 1994. It also apologized to any who were offended by the story and thought the company was responsible for it. Microsoft spokeswoman Christine Santucci noted, "We have no idea where it came from and no way to trace it. We thought it would go away on its own… It shows that the world is becoming a very small place. Electronic communications have a lot of power." Through the MICROSOFT Network, the company's new on-line service, "we will make the sacraments available on-line for the first time" and revive the popular pre-Counter-Reformation practice of selling indulgences, said Gates. "You can get Communion, confess your sins, receive absolution -- even reduce your time in Purgatory -- all without leaving your home." A new software application, MICROSOFT Church, will include a macro language which you can program to download heavenly graces automatically while you are away from your computer. Pope John Paul II said little during the announcement. When Novello chided Gates, "Now I guess you get to wear one of these pointy hats," the crowd roared, but the pontiff's smile seemed strained. The deal grants MICROSOFT exclusive electronic rights to the Bible and the Vatican's prized art collection, which includes works by such masters as Michelangelo and Da Vinci. But critics say MICROSOFT will face stiff challenges if it attempts to limit competitors' access to these key intellectual properties. "The Jewish people invented the look and feel of the holy scriptures," said Rabbi David Gottschalk of Philadelphia. "You take the parting of the Red Sea-- we had that thousands of years before the Catholics came on the scene." But others argue that the Catholic and Jewish faiths both draw on a common Abrahamic heritage. "The Catholic Church has just been more successful in marketing it to a larger audience," notes Notre Dame theologian Father Kenneth Madigan. Over the last 2,000 years, the Catholic Church's market share has increased dramatically, while Judaism, which was the first to offer many of the concepts now touted by Christianity, lags behind. Historically, the Church has a reputation as an aggressive competitor, leading crusades to pressure people to upgrade to Catholicism, and entering into exclusive licensing arrangements in various kingdoms whereby all subjects were instilled with Catholicism, whether or not they planned to use it. Today Christianity is available from several denominations, but the Catholic version is still the most widely used. The Church's mission is to reach "the four corners of the earth," echoing MICROSOFT's vision of "a computer on every desktop and in every home". This was the first internet hoax to reach a mass audience and attracted a significant amount of media attention. Its success was interpreted as demonstrating the power of the internet to disseminate information, or misinformation, in ways that sidestepped the traditional gatekeepers of the media. A follow-up fake news story that subsequently circulated online announced that, in response to Microsoft's acquisition of the Catholic Church, IBM had bought the Episcopal Church. The authors of these fake news stories remain unknown. The Chairman of IBM announced today that, in response to Microsoft Corp.'s acquisition of the Roman Catholic Church, IBM has bid for and acquired the Protestant Episcopal Church in the United States of America for $1 billion. "We are the oldest and most prestigious computer company in the world," he said, "and we cannot be seen to be lagging behind in the race for preeminence in the religious software and hardware markets. We have tendered an offer to the Most. Rev. Edmund Browning, Presiding Bishop of the Episcopal Church and Pamela Chinnis, President of the House of Deputies of General Convention, and they have recommended acceptance to the shareholders/communicants." The Episcopal Church is one of the oldest and most respected denominations in the United States. Many current and former officeholders, including many Presidents, have been communicants. Although its membership was declining in recent years, the latest figures show a slight increase in membership. A combination with IBM will probably be beneficial in terms of putting "fannies in the seats" in Episcopal Churches across the United States. There will also be great benefits to IBM in terms of international connections through the Episcopal Church. The Church is one of the most senior members of the international Anglican communion by way of its separation from the Church of England after the Revolutionary War and the consecration in 1784 of its first Bishop, Samuel Seabury. IBM hopes to gain a foothold in the international religious business through these connections, and perhaps tender a bid for the entire Anglican Communion by the time of the next meeting of the world Anglican bishops in London in 1998 (Lambeth Conference). The Archbishop of Canterbury, The Most Reverend George Carey, could not be reached for comment. His Eminence Bill Gates, had no comment. "Church Mourns Miracle That Might Have Been," The Seattle Times (December 20, 1994): B2.